Nikon was one of the last big camera makers to offer a mirrorless model but when they finally announced the Nikon 1 system back in September, 2011, they attracted some controversy for adopting a new smaller sensor than rivals. Since then, they’ve done well to increase popularity of the system by expanding the range of lenses in a relatively short time frame. 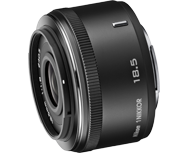 The 1 Nikkor 6.7-13mm f/3.5-5.6 and the 18.5mm f/1.8 are two of the newest models from the firm. Read on to see how well they perform when mounted on the Nikon 1 V1 body.